Northmor Elementary School students were invited to come and explore the wonders of math and enjoy an exciting evening of hands-on learning. IBERIA — Northmor Local School District held a “Math Around Around Town” themed Family Math Night on Thursday, Feb. 21. Northmor Elementary School students were invited to come and explore the wonders of math and enjoy an exciting evening of hands-on learning. In addition, local businesses shared with students the math they encounter in their professions. 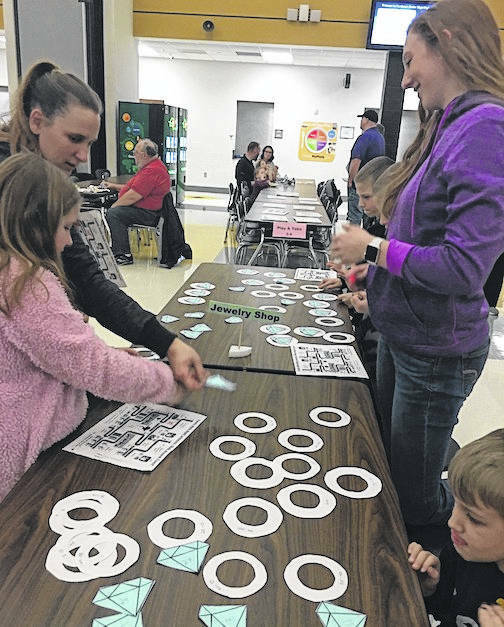 Family Math Night involved the entire community: elementary students, parents/guardians, high school/junior high students, teachers, administration, and local businesses. A group of about 30 high school/junior high students volunteered their time to create and run hands-on math games for the event. The students were required to have two different levels for their game: kindergarten-2nd and 3rd-6th grades. The games included topics such as: patterns, basic math facts, fractions, and money. Keeping with the theme of the night, the students received a map upon arrival. The students used the map to visit each shop in “our Northmor town.” At the shops, students enjoyed the activity led by the junior high and high school students. For example, one station, the Jewelry Shop, used templates of rings that contained math facts. The students had to match the ring with the diamond that had the correct answer. The event also included local businesses: Earthworm Construction (owner, Louie Cortez), Morrow County Hospital (Director of Pharmacy, Holly Trainer), First Federal Bank of Ohio (Branch Manager, Rachael Peterson and Assistant Manager, Jessica Hersberger), Lightning Bolt Fasteners (owner, Niki Lilly), and Northmor LSD Fiscal Office (Treasurer, Tammi Cowell and Assistant Treasurer Marcie Whited). They volunteered their time to set-up an activity that highlighted some math used within their business. Their activities created interest within the profession and intrigued students and parents. The numerous volunteers made Family Math Night a very successful event. It showcased the student-leaders at Northmor Local School District. Mrs. Lisa Keddie appreciates the students, teachers, parent volunteers, the local businesses, and the administrators for supporting the event, and Northmor’s PTO for donating hot dogs, chips and water. Thanks to the Morrow County Retired Teachers Association for the grant to help fund this event.